Ahhh, my hometown. Well, I'm not from here (no one seems to be), but I have been here long enough that I can almost call myself a native (I did go to college here, and that was a LONG time ago!) . This is a semi-long exposure (7 seconds) that I did while out on a photowalk with my local buddies: Pete Talke, Andy Atmtx, Mike Tuuk, Dave Wilson, and Todd Landry, who was in town from Dallas. We had a great time and took a lot of shots that night. This one started life as a 5 shot HDR, but I wasn't really into it, so I opted for this single exposure, which I like quite a bit. 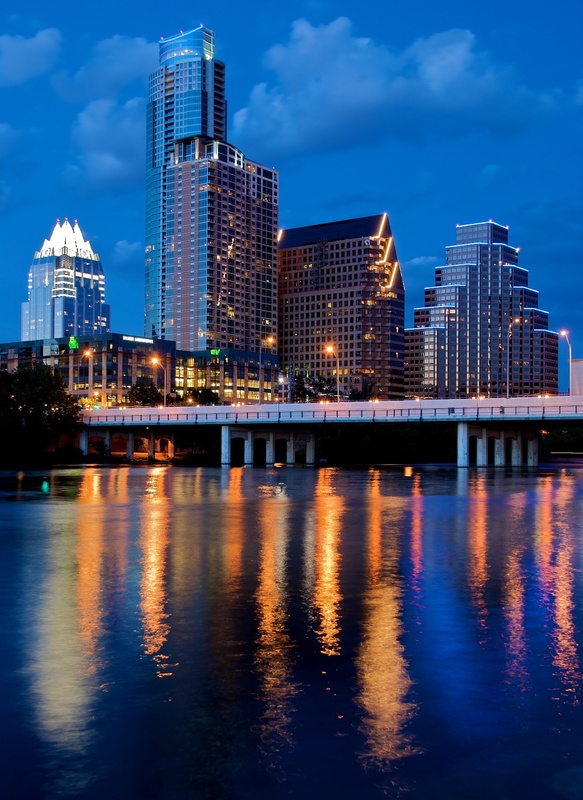 Our skyline has changed a lot over the years, as more and more folks decide Austin is the place to be, and pack it up and move here. They'll probably keep coming, too. It really is a great town, and has the added benefit of a river running through town so you can get those colorful lights reflected in your shots!